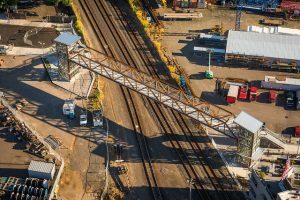 The Rhine-Lafayette Pedestrian Overpass in southeast Portland will be undergoing improvements to increase the reliability of the bridge’s elevators. The project will require the full closure of the Rhine-Lafayette overpass at times. We will install HVAC equipment inside the elevator towers to regulate the temperature and humidity year-round. We also will be installing canopies over both elevator towers and adding drainage at the base of the towers to prevent rain from getting into the elevator mechanisms. The improvements will take about six weeks and require the full closure of the Rhine-Lafayette overpass at times. The first full closure of the bridge begins the first week of December. The elevators will be shut down for three days, with the stairs open early and later in the day to reduce impact on nearby schools and businesses. UPDATE: Monday, Dec. 3 – Wednesday, Dec. 5: Elevators closed, with full overpass closure between 9 a.m. and 3 p.m.
During the closures, a detour will guide pedestrians and cyclists north to SE Powell Boulevard to cross under the railroad tracks. Those who use the Rhine-Lafayette overpass should plan an extra 10 to 15 minutes to navigate the detour between both sides of the bridge. From the east side of the bridge, proceed north on SE 20th Avenue about 0.2 mile, then go west on SE Powell Boulevard another 0.2 mile. Cross SE Powell Boulevard Frontage Road and proceed south about 0.15 mile to SE Rhine Street. From the west side of the bridge, proceed north on SE 17th Avenue about 0.15 mile and cross SE Powell Boulevard Frontage Road to SE Powell Boulevard. Go east on SE Powell Boulevard for another 0.2 mile and turn south on SE 20th Avenue for 0.2 mile to reach SE Lafayette Street. The Rhine-Lafayette Pedestrian Overpass connects SE 18th Avenue with SE 20th Avenue over the Union Pacific Railroad tracks in the Brooklyn neighborhood. It provides connections to TriMet’s MAX Orange Line at the SE 17th Ave & Rhine St Station as well as to the Line 17-Holgate/Broadway, Line 70-12th/NE 33rd Ave and Line 291-Orange Night Bus.